In previous posts, we’ve described behaviors seen in every baby such as states, cues, and changing sleep patterns. Of course, every parent knows that babies are individuals, full of special qualities solely their own. Parents spend much of the first few months of their babies’ lives learning, often the hard way, about their newborns’ “temperament,” the special combination of traits that form each baby’s unique personality. Some of these traits are ingrained in babies at birth and others are influenced by their interactions with the world around them. In this post, we’ll describe some of the traits commonly used by researchers and health care providers to assess infants’ temperament. This list is not complete and different researchers and doctors can have different names for some of these traits. We are using this list only to give you an idea of some of the specific traits you might want to look for in your baby. Before I go over the details, you should know that many babies’ traits change over time, some shift slightly and others change radically. No matter how well we think we know our children, there are always a few surprises around the corner. 1. Activity refers to how much babies move around when given a chance. A highly active baby will be constantly on the move, kicking his legs and squirming excitedly as a newborn and climbing up on anything he can when he gets older. The less active newborn will be content to lie quietly watching a mobile or sit in your lap listening to a several books when she gets older. 2. Regularity refers to how easily babies develop and stick with routines. Babies with more regularity develop their own internal rhythms, tending to eat, sleep, and play at consistent times throughout the day and night. Other babies just can’t seem to settle into a schedule no matter how much parents work on developing a steady routine. 3. Approach-Withdrawal refers to the willingness of babies to interact with new people, toys, or environments. Some babies are excited to see new faces and places, others shy away, burrow into mom or dad’s shoulder or turn away from any new person or activity. 4. Adaptability refers to how quickly babies’ adjust to new experiences. Even babies who initially withdraw from new situations will differ in how long it takes before they get comfortable. Adaptable babies will settle down quickly when they meet new people or are brought to new places. Less adaptable babies take a long time to feel comfortable in new situations. 5. Intensity refers to the strength of babies’ emotions when dealing with the world around them. Some babies shriek hysterically when they are unhappy and others just whine. Happy babies can show differences in intensity too! Some happy babies will giggle with glee while others just smile. 6. Sensory Threshold refers to how much sensory input is needed to get a response from a baby. Some babies are highly sensitive to noises, smells, and bright lights while others are not. 7. Distractibility refers to how easily babies can be distracted from unpleasant or dangerous things. For example, some babies are easily redirected away from the dog’s water dish by a toy or a book and others will keep crawling back, no matter what parents do to distract them. 8. Attention Span refers to how long babies stay focused on something that interests them. Some children are content to play with blocks or a single toy for a long time, others quickly shift their attention from one toy or activity to another. To help you get a better picture of how these traits fit together, I’ll tell you about my own babies (they are both in their 20s now). In an earlier post, I told you that my daughter was a persistent crier (for about 4 months), and I learned later she had a very low sensory threshold. She was active, but not overly so, intense in her responses (both happy and sad), slow to approach new situations, but quite adaptable once she was familiar with people or places. She thrived on routine and developed consistent patterns for sleeping and eating quite early in her life. She had a surprisingly long attention span and was never distractible if she really wanted something. In contrast, my son was highly active, rarely cried, was not as intense as his sister in his responses to the world, loved new people and places, had a relatively high sensory threshold, and was easily distracted away from dangerous things. Like his sister, he had a long attention span. He also adapted readily to new situations but was not very good about eating and sleeping according to any kind of routine. Surprisingly, very different temperaments can emerge in children from the same family. My daughter might have been considered a more “difficult” baby than my son but her intense concentration and interest in the world has resulted in her being the scholar in the family. My highly active, adaptable son is one of the captains of his college baseball team. If you know what to look for, infancy and childhood are full of hints about the adults your children will become. For now, learning about your baby’s temperament can help you feel a lot more confident that you are the expert when it comes to taking care of your baby. Next time: We’ll take a closer look at how a baby’s temperament influences her relationships with her parents and other caregivers. All of us at the UC Davis Human Lactation Center wish you and yours a very happy Thanksgiving! We'll be back early next week with a new post! The Insanity of Parenting: Have You Seen the Job Description? Hours: 24 hours per day, 7 days per week for approximately 18 to 20 years. On Call Duty: For the rest of your life. Working Conditions: Must be able to endure severe sleep deprivation, strong smells, stressful situations, and loud unpleasant noises. Pay: No monetary compensation, considerable long-term expenses for the job holder. Given the stress, expense, and challenges of parenting, it is a wonder that so many of us choose to take on this important job. Amazingly, many of us are crazy enough to become parents over and over again! Obviously, there are many rewards that come from parenting. Ask most parents, especially after they have caught up on a little sleep, and they will tell you that the wide-eyed wonder in their children’s eyes and the connection and love they feel for their children make it all worthwhile. In North America, our culture is filled with movies, television shows, commercials, and holidays celebrating the special role that parents play in their children’s lives. Yet, I imagine that contemporary mothers and fathers watching those portrayals of families in old shows and commercials must think that parenting is a lot tougher now than it used to be. I, for one, would have to agree. While we’ve all heard that old adage “it takes a village to raise a child,” very few of today’s parents have anything like a village to turn to when things get tough. More often, new parents are isolated from family, friends, neighbors, and sometimes even from each other. In today’s society, there are few grandmothers who can come and sit with the baby while mom takes a nap or dad makes something to eat. Instead, parents who already are physically drained by the birth experience and sleep deprivation, are on their own in caring for their babies. Overwhelmed by the time and effort needed to care for the baby, both parents wonder why the other can’t do more to help. Parents who are lucky enough to have a job in this economy find that they have to return to work very early in their children’s lives. Some, especially fathers, have no time off at all. No wonder the scientific literature is filled with studies of how overwhelmed, isolated, and tired new parents feel. It is hard to imagine but the explosion in the use of the internet is less than a decade old. With “smart phones,” broadband connections, and Wi-Fi everywhere, parents are virtually surrounded by an army of parenting experts full of contradicting “truths” along with tragic stories about children whose parents didn’t follow their advice. With so much research on child development, it seems it should now be possible to raise a “perfect” child by following all the rules that recent science provides. Instincts and feelings, relied upon by so many previous generations (including my own), may seem to be old-fashioned or even primitive in today’s information-saturated world. Fearing making mistakes that might scar their babies, today’s parents struggle with day-to-day decisions and many live with constant guilt. Parenting is both terribly hard and tremendously rewarding. Through parenting, many of us gain a sense of purpose and reach levels of intimacy with our children, partners, and families that we never dreamed possible. We take pride in and love our children, yet many of us struggle to meet our other responsibilities fearing that we aren’t doing enough in any of the roles we play. Over the next few weeks, we’ll be sharing more about what is known about parents’ roles in shaping their children’s lives. Next time, we’ll help you identify characteristics in your own child that can help you better understand his unique nature and how these characteristics influence his relationship with you and others. Through understanding more about your baby and your relationship with him, we hope that some of the stress you’re enduring can be reduced. Given the barrage of information that you’re already getting, we’ll make sure to keep the posts straightforward and concise. We've been focused on babies since we began our blog. Now, it's time to widen our perspective to include babies' hardworking parents too. From the beginning of "Secrets of Baby Behavior," we've focused on helping parents gain a better understanding of their babies' sometimes mysterious needs and behavior. We've done our best to create a vivid and realistic picture of what it is like to care for babies from birth to 12 months of age. While we have a lot more "secrets" to share about babies, we realize now that we are long overdue in talking about how parents fit in! Over the next few weeks, we'll focus our posts on the amazing interactions among biology, personality, instincts, and love that create and nurture the unique relationships that develop between parents and their infant children. We hope that you'll enjoy our new series and that you'll share your views and comments with us. All new mothers want their babies to be well fed, comfortable, and happy whenever possible. Because babies aren’t able to use words, parents have to rely on powerful, but limited, cues that babies use to communicate their needs. In the past, we’ve shared basic information about these cues and what to do about them. While most parents find babies’ early cues to be confusing, there are some cues that can be particularly misleading. We thought it would be useful to put three of the most common misleading newborn behaviors in one post. Important Note: These behaviors are misleading only if the baby is healthy, his weight gain is good, he has frequent dirty diapers, and he is demanding to be fed at reasonable intervals. If you have any concerns about any of these important indicators that feedings are going well, be sure to see your baby’s doctor. Why do some babies fuss, turn or arch away from the breast or bottle when they seem to be hungry? What might you see? Some babies who are using hunger cues will seem to “reject” the breast or the bottle when their caregivers try to feed them. Before they begin to feed, some babies may turn their heads away, arch, stiffen, push away, and cry. This may be more common in newborns and in babies who are easily distracted between 4 and 7 months of age. These behaviors can be misleading to parents who don’t know how to respond to these babies who can’t seem to make up their minds! Why might this happen? Remember that babies are born with limited communication skills. Newborns have very little control over their bodies and a “vocabulary” that’s limited to “Yes, I want to interact” (engagement cues) and “No, I need a break” (disengagement cues). Imagine a baby is hungry and wants to feed but just as he is about to latch, a dog barks, and his big brother comes running into the room shouting. Using disengagement cues, baby tries to tell mom that he doesn’t like the noise or the movement around him. Because mom is concentrating on trying to feed the baby, she may not pay attention to what is going on around her and she may miss early cues that baby needs something to change before he can eat. When a hungry baby refuses to feed, it is important to pay attention to the big picture. Is baby uncomfortable for some reason? Are the lights too bright? Are noises too loud? Some babies are sensitive to their surroundings, others are not, and some are irritated by distractions only for short periods of time. Sensitive babies may feed better if they are able to do so in a place that is relatively free of distractions. Why do some babies cry 5-15 minutes after nearly every feeding? What might you see? Some healthy newborns and young babies who are eating and growing well may routinely cry or fuss after they’ve been fed. At the same time, they may twist, arch, and turn away from caregivers who are trying to help. This can mislead parents into thinking that the baby is still hungry even though the baby is not using any hunger cues. Why might this happen? These babies may be particularly sensitive to their own bodily functions such as needing to burp, poop, or pee. When babies feed, these functions become active. Since these bodily sensations are new, some babies find them irritating and distracting. Babies, who fuss and twist routinely after good feeds, may be signaling that they “need a break” from their own body functions. How can you tell if this is the problem? Pay close attention to the timing of the fussing. Is it predictable? Does baby routinely need diaper changes just a few minutes after the fussy time? Does an extra burp seem to help? Imagine what life would be like not knowing why your body keeps making your tummy and bottom end so uncomfortable. Comforting your baby until the diaper needs changing can make everyone a little happier. Fortunately, most babies quickly grow out of this phase. Why do some babies wake up every time you try to put them down for a nap after feeding? What might you see? Newborns typically sleep more than 15 hours per day. Many parents think that newborns only “eat, sleep and poop.” Of course, new parents are exhausted because babies wake so frequently. It is not unusual for a newborn to drift off to sleep after nearly every feed, only to wake and fuss moments later when mom tries to put her down for a nap. This waking can mislead mom or dad into thinking that the baby is still hungry even if the baby has had a good feeding. After all, wouldn’t a baby who was “full” stay asleep? Why might this happen? Until babies are about 4 months old, they fall asleep into a light state of sleep called “active sleep.” Dreaming is so important to babies’ brain development that they dream far more than adults. Newborns may dream for 20 or 30 minutes after they first fall asleep. Babies who are dreaming may wake up when you change their position or put them down. You can see when your baby is dreaming (her muscles will twitch and her eyelids will flutter). If you wait a few minutes and put your baby down after she stops showing signs of dreaming, you’ll find she isn’t likely to wake up right away. The periods of initial dreaming (and light sleep) shorten within the first few weeks of life, making it easier to put baby down to nap. When your baby is around 3 or 4 months of age, she’ll fall asleep in a deeper type of sleep and she’ll stay asleep for longer stretches of time! Next time: We’ll introduce our new series on how parents develop relationships with their babies. Bringing home a baby who was born prematurely is a big milestone! In a previous post, I described how it felt to bring my daughter home almost 2 ½ months after she was born. It was exciting that she was strong enough to come home, but it was a little scary too. Even though she was finally home, our experience was still different than it would have been if she had been born at term. We were careful about taking her out in public and about having visitors at the house, so that she wouldn’t be exposed to germs and illnesses. In the first month, we visited the pediatrician weekly, then monthly for the next year. Now that she is older, we visit the pediatrician on the typical schedule, once every few months. In addition to her normal pediatrician, we have appointments with a special medical team who evaluate her development. Because babies who are born early develop differently than most babies, it is important to monitor their progress and identify any issues early. Where families receive their developmental follow-up depends on a number of factors, including but not limited to type of insurance, location, and the infant’s risk level. One way is through an Early Intervention Program (EIP) which is a federal- and state-funded program for infants who are at risk of developmental delay. We had our appointments at a follow-up clinic connected with the hospital where Olivia was born. The hospital should provide information about who will be conducting the follow-up visits before your baby is discharged. The number of appointments needed varies based on degree of prematurity, health status, and developmental progress. During the appointment, evaluations will be conducted by a number of different specialists. The development team typically consists of developmental pediatricians, nurse practitioners, physical therapists, occupational therapists, clinical psychologists, social workers and ophthalmologists. We had our first developmental follow-up appointment when Olivia’s chronological age was 10 months and her corrected age was 6 months. Chronological age is the age from the day the baby was born. Corrected or adjusted age is the age of the baby based on the due date. For premature babies, both numbers are important. You need both numbers to get a clearer picture of where your baby should be developmentally. For example, although Olivia was 10 months old, she had just started sitting up, which is something babies usually do around 6 months of age. I remember being really nervous before our first appointment because I didn’t know what to expect. It turns out I had nothing to worry about and that I actually enjoyed finding out how Olivia was progressing. Here is an overview of what happened during our first appointment. First we met with a Pediatric Nurse Practitioner, who took Olivia’s measurements (weight, length, and head circumference), evaluated her muscle development and reflexes, and discussed her health history with us. The measurements were taken using very precise methods. Muscle development is examined because premature infants’ muscles develop differently than they would have in utero. For example, the muscles required to have a straight, stretched out body develop early in pregnancy, when there is plenty of room in the womb. As babies get bigger, the amount of space in the womb decreases, forcing them to curl into what is commonly called the fetal position. Babies who are born very early have to develop the muscles needed to curl up after they are born and the difference between developing in the womb and in a crib can affect how they learn to sit, crawl, and walk. It is very common for premature babies to have tight muscles and joints. Olivia’s ankles were especially tight, so we were given exercises to help them loosen up and make it easier for her to walk when she was ready. Next, we met with a physical therapist, who conducted a developmental evaluation. The physical therapist used the Bayley Scales of Infant Development. The assessment evaluates cognitive development, receptive language, expressive language, fine motor development, and gross motor development. During the assessment, the physical therapist uses different toys to test the baby’s abilities and observes how the baby interacts with both her parents and with the world around her. The last person we met was the social worker. She asked us questions about our support system (family, friends, etc), our work, and our life at home. The goal of the social worker is to determine how your family is coping with the new child and to address any needs you may have. After the appointment, the medical specialists developed a report about Olivia’s developmental status. Copies of the report were sent to her pediatrician and to us. Summaries of the team’s observations were provided along with the scores from the developmental evaluation (based on both chronological age and corrected age). The final section of the report described the team’s recommendations and referrals. So far, Olivia has visited the follow-up clinic twice, at 10 months and 18 months, and she is scheduled to go again at 26 months. Our second appointment was much like the first, just with different tests. Even though I was nervous before our first appointment, now that we’ve been through it, I am grateful for the opportunity to see how Olivia’s development compares to that of children born at term. It has also relieved some of our stress to know that she will get the help she needs if she encounters any difficulties. Next time: We’ll describe some baby behaviors that can be misleading. Baby Behavior Basics: Why babies wake up at night, babies' moods (or "states"), how babies communicate with adults, and why babies cry so much. 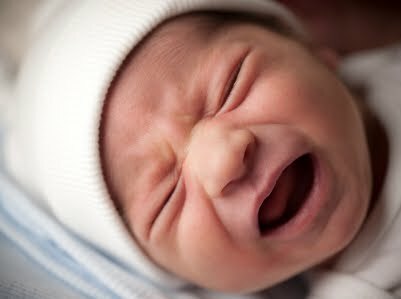 Crying: What's the difference between crying and colic? We'd like to thank all of you who have been recommending Secrets of Baby Behavior to others. We encourage you to post questions and comments as they come to mind so that we can continue to help you learn more about infant behavior. I can remember being very excited to start solids foods with my daughter (what dietitian turned first time mom wouldn’t be, right?). I saw starting solids as an important milestone to be achieved. And though I knew that starting solid foods would not help my baby sleep through the night (yes, I’ve read the research! ), I secretly hoped it might help her sleep just a little bit longer. I can remember family members saying “Oh! She’s eating solids now. She must be sleeping more at night!” Then, they would look at me strangely when I would say “Nope. It had no effect on her sleep. In fact, she may be waking more frequently now.” They would counter with: “Wow. She’s a stubborn one!” True. She was (and is) one stubborn girl, but babies sleep through the night when they are ready to, and starting solids or giving a nice hearty bowl of oatmeal before bedtime won’t change that. I’m sure I was not the first parent (or the last) to be confused by all of the information out there about starting solid foods. So, the following information is based on the American Academy of Pediatrics recommendations, my experience as a dietitian working with mothers and infants in a clinic setting, and my experience raising (and feeding) my own little girl. In the past, parents have been told to start solid foods when their babies are around 4-months old. Then, in 2004, the American Academy of Pediatrics provided updated recommendations stating that “infants may be physically ready to accept solid foods sometime between 4 and 6 months.” And just to make it more confusing, the Breastfeeding Section of the American Academy of Pediatrics* published their own recommendation stating that “Complementary foods rich in iron should be introduced gradually beginning around 6 months of age.” But, results from a 2008 study** showed that nearly half of all infants are still being fed solid foods before 4 months, and many doctors are still recommending starting solids around 4 months old. No wonder parents are confused! While an infant’s GI (gastrointestinal) tract may be capable of handling solid foods by 3-4 months of age, oral, gross, and fine motor skills required for eating solids generally don’t emerge until around 4-6 months of age. Yes, that is a wide age range, but the new guidelines focus more on developmental readiness than on age. One baby may be ready at 4 months, while another isn’t ready until 6. When I tried to feed my daughter baby cereal at about 5 ½ months, she immediately turned her head away. I tried again at her next mealtime and she spit the cereal all over me. I took that as a sign that she wasn’t quite ready. 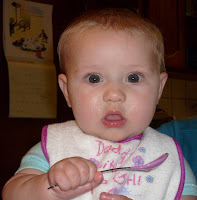 So, how do you know for sure when a baby is developmentally ready to eat solid foods? Your baby needs to be able to do ALL of the following things to be ready to eat solid foods: sit up with support, hold her head steady, put her fingers or toys in her mouth, show she wants food by opening her mouth, close her lips over her spoon, show she doesn't want food by turning her head away and keep food in her mouth and swallow it. The important thing is to start with an iron-rich food. Examples are iron-fortified infant cereal or baby food meats. Many parents start with cereal. You do want to start with single-ingredient foods, and feed only one food at a time to identify any foods that the baby may be allergic to. After starting a high-iron food, there is no specific order for new foods as long as there is a gradual progression of textures as tolerated. The progression of textures is smooth, mashed, chopped, and then tiny pieces. Just be sure that one texture can be chewed and swallowed before moving onto the next one. Watch your baby’s cues. Babies will let you know when they have had enough. My daughter was very dramatic about this. When she was full, she would pick up her bowl of food and throw it across the room. Other, less messy, fullness cues include slowing the pace or stopping eating, spitting out or refusing the food or spoon, batting the spoon away, or closing mouth as spoon approaches. Maybe I should have paid closer attention to those early cues! If your baby doesn’t eat solid foods when you first offer them, don’t panic! At first, babies must learn to eat solid foods. Respect your baby’s fullness or disengagement cues, and try offering the food at a later feeding or on another day or week. Never force your baby to eat; that can create feeding problems later in life. As far as sleeping through the night is concerned, adding a little cereal before a baby is ready for it can do more harm than good and it won’t help a baby sleep longer. Starting solid foods early has been linked to increased risk for developing allergies and diabetes. As always, talk to your baby’s doctor about when it is best for you to start solid foods. But be sure to watch for those early disengagement cues, or you might get hit by a flying bowl! Here are the answers to last week's quiz. 1. True or False: Healthy babies cry for 1-4 hours per day. The answer is True. Healthy babies usually cry between 1 and 4 hours a day. Some babies may cry less and some may cry more. Crying is just one way babies communicate. 2. When do most babies start smiling on purpose? Most babies start social smiling at 6-8 weeks old. You may see a newborn smile once in a while, but it is just a reflex. Even though they haven't gained control over their smiles, young babies love to see your smiling face! 3. What is the greatest amount of children born to one woman? The record number of babies born to one woman is 69. According to the Guinness World Records, in the 1700s a Russian peasant gave birth to 16 pairs of twins, 7 sets of triplets, and 4 sets of quadruplets. 4. What percentage of a newborn's weight is from the head? A baby's head makes up 25% of their body weight. 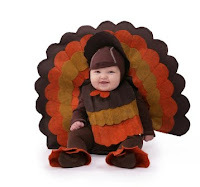 If you think babies' heads seem big for their bodies, you are right. Adults' heads make up only about 8% of their body weight. 5. What percentage of babies take their first step by 11 months of age? The answer is 10%. Another 40% take steps around their first birthday. Another 10% take their first steps by 15 months old. When it comes to walking, there is a wide range of what is normal. Babies learn to walk at their own pace, most often between 9 and 16 months of age. How'd you do? We'd love to hear from you!